Donald Trump has expressed doubt that the new sanctions on Pyongyang will have “any impact,” but said it was “nice” of UNSC to unanimously approve the US-drafted resolution watered down to accommodate Russian-Chinese concerns. “We think it's just another very small step, not a big deal,” Trump told reporters at the start of his meeting with Malaysian Prime Minister Najib Razak. “I don't know if it has any impact, but certainly it was nice to get a 15-to-nothing vote, but those sanctions are nothing compared to what ultimately will have to happen,” said Trump, according to Reuters. The US has still not ruled out a military option to halt North Korea’s nuclear development, the White House confirmed Tuesday. “The President is committed to taking every step and keeping all options on the table in order to have a denuclearized Korean Peninsula,” White House spokeswoman Sarah Sanders told reporters. After a number of last minute compromises, China and Russia went on to support the latest round of sanctions against Pyongyang Monday. The ninth set of punitive UNSC measures against the communist regime fell significantly short of the far-reaching consequences the Trump administration had demanded following North Korea's sixth nuclear test earlier this month. Instead of banning oil imports altogether, the sanctions authorized an annual cap of 2 million barrels of refined petroleum products to North Korea. The sanctions also place a limit on crude oil exports to the communist regime at current levels. The UNSC also imposed a ban on the country's textile exports, North Korea's second-biggest export. In addition, the UNSC empowered countries to inspect ships going in and out of North Korea’s ports but did not authorize the use of force to conduct such searches as the Trump administration had originally proposed. Russia’s Ambassador to the United Nations, Vassily Nebenzia, told the UNSC that while Moscow does not endorse North Korea’s nuclear ambitions, it doubts whether sanctions will achieve the desired results to bring peace and stability to the Korean peninsula. Nebenzia stated that Moscow will continue push for the implementation of the so-called Chinese-Russian “double-freeze” proposal, which calls for Pyongyang to suspend its nuclear and ballistic missile tests in exchange for a halt in joint US-South Korea military drills. Chinese foreign ministry spokesperson Geng Shuang said Tuesday morning that the points laid out in the dual track approach are practical methods to solve the Korean crisis. “We called on the relevant parties to work with China to push for dialogue and negotiation and make joint efforts to realize peace and stability on the Peninsula,” he said. Washington has so far rejected the proposal, saying that it has every right to conduct exercises with its ally, South Korea. Instead, for now, the US is trying to pressure China to exert more influence on its communist neighbor. 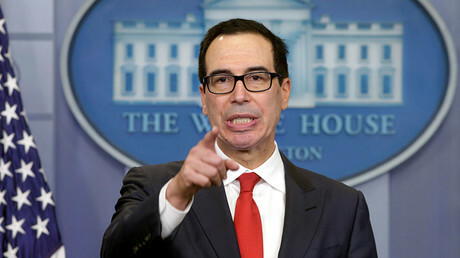 US Treasury Secretary Steven Mnuchin threatened Tuesday to impose economic sanctions on China if it does not implement the new sanctions regime against North Korea. “My delegation condemns in the strongest terms and categorically rejects the latest illegal and unlawful UN Security Council resolution,” North Korean Ambassador to the UN Han Tae Song said in Geneva Tuesday. “The forthcoming measures by DPRK will make the US suffer the greatest pain it ever experienced in its history,” the ambassador added. No sanctions will make North Korea change its policies, Pyongyang’s ambassador to Moscow meanwhile noted. “We have lived under US sanctions for decades. Under the harshest of sanctions. But we have acquired everything we wanted to. 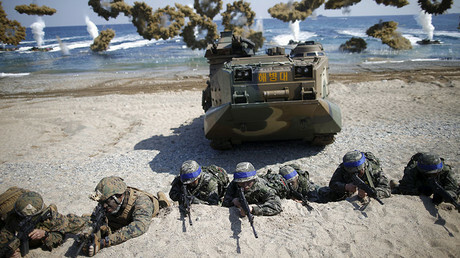 If the US hopes that our position would be shaken and changed, that is an illusion,” Kim Yong-jae told Russian media.